How did medieval people run their households? Those quotidian concerns – of provisions and repairs, staffing and expenses – are always with us, but they are not always easy to tease out of the historical record in detail. Happily, some of the records of larger noble households have survived, at least in the form of yearly accounts, and these accounts can provide us some fascinating glimpses into the day-to-day concerns of households that are both deeply familiar and deeply apart. C.M. Woolgar’s The Great Households of Late Medieval England is a wonderfully comprehensive overview of life in those households – those linked groups of people who were at the very top of the social pyramid. On a much smaller scale, I would like to consider some specific minutiae of a single estate belonging to a single family, a family that did very well for themselves but never quite reached the dizzy heights of a great figure like John of Gaunt or Thomas of Lancaster. By the beginning of the 15th century, by dint of judicious marriage and political positioning, the Talbot family owned considerable estates in northern and western England. One such estate was Blakemere, located near the small town of Whitchurch in Northern Shropshire. As luck would have it, we have the yearly records of six of the household stewards, dating from between 1392 and 1425. The steward is in charge of all of the consumables in the house, from food to napkins to horseshoes, and all of the logistical questions related to finding them, buying them, transporting them, and making sure they get to where they need to go. He also pays wages and builds up stores of supplies for the household if possible. Looking at these records, we can find out all sorts of things: how many people lived in the house; what kinds of foodstuffs they ate frequently and rarely; what kinds of consumables a large estate might make and what it might need to purchase; how guests were housed; what staff roles were paid in food and lodging and what roles were paid in cash—and how much; even who gets to keep the rabbit skins from the kitchen. The yearly accounts track each category of expenditure, and each specific type within the category. Thus, there is a single entry for all of the ale consumed in the year, and a single entry for minstrels. Each line item must be accounted for at the annual review of accounts with the head of the household, and discrepancies could be required to be made up from the steward’s own funds. These records survive in part because of their durability; the Blakemere records were kept on long rolls of vellum, with a new piece being stitched onto the bottom of the last as the length of the account demanded it. There was also a “household book” that tracked monthly expenses and made additional notes; it is referred to in the yearly records, but since the book was kept on paper it has long since vanished. The stewards generally track similar sorts of things in their accounts, but each certainly has his own way of recording. The last records, those of Richard Kenleye from 1424-1425, are the most complete and the most “textbook” in the sense of conforming to what was current accounting best practices; the excerpts below are from his accounts. 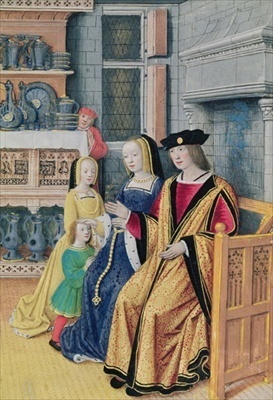 At the time of Kenleye’s records, John Talbot was Lord (Baron); he married Margaret Beauchamp in early September 1425, after his first wife, Maud de Furnivalle, died in 1423. John succeeded Gilbert, his older brother; both were sons of Richard, 4th Lord Talbot, and Lady Ankaretta Lestrange. John did very well for himself; Henry V appointed him Lord Lieutenant of Ireland in 1414, where he served for five years, and then again in 1424 for another year. He was considered a daring and agressive soldier and won considerable renown during the Hundred Years War; indeed, Shakespeare mentions him in Henry VI, Part 1. He was also made Earl of Shrewsbury 1442 (a title that is now in abeyance). It is interesting to compare Kenleye’s records with those from 1392, when Richard, Lord Talbot was lord of Blakemere; Richard was certainly a nobleman of good standing, but not quite so successful as his second son; the expenditures of the latter steward are definitely higher and the tastes a bit richer. The grain purchased is mostly wheat, mostly for bread—more than 37,000 loaves—but also 4 bushels for pastry and one for frumenty. Wheat is also fed to poultry and partridges; 4 bushels for the former and an entire bushel just for the latter. Rye is mostly made into bread, and mostly that for the dogs and even the horses, who also get oats and hay. (Everyone eats bread – it is not a figure of speech at this time to call it the staff of life!) Nearly 600 additional wheat loaves and nearly 150 rye loaves (for dogs) are bought from nearby Whitchurch, but the rest is baked in-house. The household purchases 17 pounds of pepper but only 18 pounds of sugar; 14 pounds of ginger; 17 pounds of raisins; 4 pounds each of mace and canel (akin to cassia); 3 pounds each of saffron, sanders, and cloves. (These vary widely by taste and how and when the family is at Blakemere – the account ten years earlier has 25 pounds of pepper!) Many of the spices are for Christmas, purchased in Shrewsbury or London.The fruit purchased is dried – quinces, currants, dates (36 pounds! ), raisins, figs. There are 9 pounds of almonds – most commonly to make milk substitutes in Lent – and 63 pounds of rice, which is recorded as a spice. Not unreasonable considering that it might have to travel nearly as far! As a nod to the value of these spices, they are not kept in the kitchen; instead the bulk of this hoard is kept in the household treasury, along with all the coinage. Salt is purchased by the bushel, most probably for curing meat and fish; 61 gallons of olive oil are purchased for Lent, most probably to address the limitations on animal fats like butter and lard. The olive oil is most likely from southern France, much like the wine, given English holdings there; it is still fairly dear, at 13 shillings for the whole quantity. Beef, pork, and birds of various kinds are certainly eaten in quantity (indeed, there is an entry for 334 blackbirds! ), but there is an overwhelming amount of fish, with 22,000 salt herrings, among many other salted fish, including salmon from the lord’s stores in Ireland. There is certainly a taste for fresh fish when available, though – the waters of the estate and surrounding environs have pike, pickerel, bream, tench, perch, and roach. Quite a lot of ocean fish as well, as well as salmon and eels; these were probably transported in baskets. 9000 eggs bought and 330 gallons of milk; an interesting note, given that there are also records of poultry and cattle on the estate. Too great a demand, perhaps? There are pounds and pounds of wax candles purchased (more than 75 pounds), but the mainstay would have been the 1000 tallow candles made from the kitchen process leftovers. As to the fate of other kitchen byproducts, it is interesting to note the entry for 177 rabbit skins “to Thomas Cook as his fee”. Nothing is wasted! The Talbots kept a tidy table; Kenleye purchased 74 ½ ells (112 ½ yards) of various cloth for napery (napkins and tablecloths). A funeral is recorded for “the lord’s daughter ” (perhaps an infant? I have not found a record of a named child that matches these dates). The supplies needed for a funeral are evidently wax candles, loaves, ale, cheese, an offering, and alms. On the anniversary of Lady Ankaretta’s death, money is likewise paid to various clergy for their services, and also for an oblation, although where it is given is not noted. Gifts are also listed, mostly from other persons of similar statation, although one is from a tenant: capons, partridges, a doe, fish, a play at Twelfth Night, and oysters. The lord has minstrels, who also receive a single payment. What surprises you about these entries? Some further reading: Texts that either directly reference the household at Blakemere, or provide background on households in England in the late Middle Ages. Accounts of the stewards of the Talbot household at Blakemere, 1392-1425, translated and edited by Barbara Ross. Keele : Centre for Local History, University of Keele, 2003. – The source material for this article. The great household in late medieval England, C.M. Woolgar. New Haven, CT: Yale University Press, 1999. – An excellent overview of the structure of a medieval household. Medieval gentlewoman: life in a widow’s household in the later Middle Ages, Ffiona Swabey. Stroud: Sutton, 1999. – A more narrative account of a smaller household in Suffolk, drawn from similar records. The English Noble Household 1250-1600: Good Governance and Politic Rule, Kate Mertes. New York, NY: Basil Blackwell, 1988. – An overview in the style of Woolgar’s The Great Household, but focusing a notch or two down the social ladder; more detailed, and drawing on dozens of extant records of various kinds. Standards of Living in the Later Middle Ages: Social Change in England c. 1200-1520, Christopher Dyer. Cambridge, UK: Cambridge University Press, 1989. – A survey of many kinds of record, including archeological, to paint an economic and sociological picture of all three classes of society (lord, priest, peasant) as well as the growing urban population. Household Accounts from Medieval England (two volumes), Records of Social and Economic History, vol. 17, C.M. Woolgar. Oxford, UK: Oxford University Press, 1992. – These are the records themselves; from diet accounts (daily expense and provision records) to wardrobe accounts and accounts for corn. A representative sample from the middle to upper echelons of English society, from the earliest extant records from the middle of the 13th century to the end of the 15th. Please note: the accounts are not translated and are in the original Latin and French. Walter of Henley’s Husbandry, together with an anonymous Husbandry, Seneschaucie, and Robert Grosseteste’s Rules, ed. Elizabeth Lamond, 1890. (Entire volume available at this link in various formats.) – In the middle of the 13th century, Bishop Robert Grosseteste wrote a list of nearly thirty rules for the Countess of Lincoln on how to maintain a household and behave as its head, touching on everything from how to fill your plate at dinner to how often you should let your staff visit their homes. The other treatises in the volume concern the various ways one should correctly run an estate, from how to tend your sheep to the characteristics of an exemplary dairymaid.